The UN General Assembly designated 2015 as the International Year of Light. A global initiative to highlight the importance of light and lighting technologies to societal development. It provides an opportunity to inspire, educate, and connect people on a global scale. It is anticipated that the International Year of Light will inspire people to think of new ideas, new solutions and new products for the future. Which brings me rather neatly to a solar project that caught my eye recently. Richard Lunt, an assistant professor from the Department of Chemical Engineering and Materials Science at Michigan State University, US, and his team have developed the world’s first fully transparent solar cell. 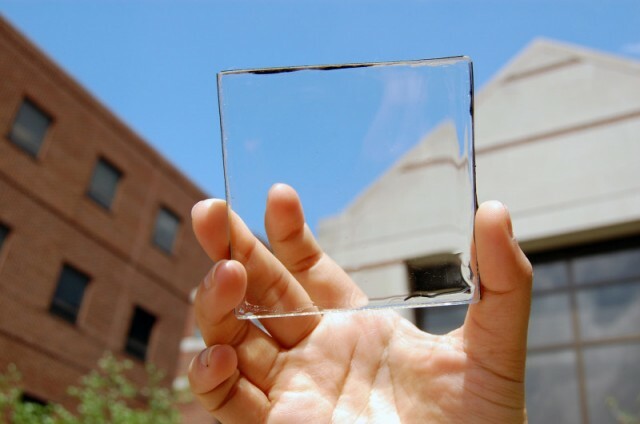 It’s called a transparent luminescent solar concentrator (TLSC) and can be used on windows, buildings and mobile phones – basically anything with a clear surface. The innovative clear coating enables any surface to convert light into energy without adverse impact on its appearance. All light is made up of electromagnetic radiation spanning a range of wavelengths. The TLSC is made of organic salts tuned only to absorb infra red and ultra-violet light. The visible light detectable by the human eye passes through a TLSC unhindered. The salts are formulated to emit light when irradiated at certain infra red frequencies. This light is directed via tiny plastic channels to thin strips of conventional photovoltaic solar cells at the edges of the panel. There’s a drawback. Because, all of the incident light isn’t being used, the energy conversion efficiency of a TLSC is far inferior to conventional solar panels. Energy conversion efficiencies of 46% have been reported for the latest multi-junction solar cells. At present, the transparent cells being developed by Richard and his colleagues have an efficiency of around 1%, but the team reckon that 5% may be possible as the product is developed further. But consider the bigger picture. Standard photovoltaic solar panels are thick, heavy and opaque, making them difficult to locate where power is needed most. This is one of the reasons why solar farms are springing up all over Europe and elsewhere. Fields of cows are being replaced by fields of silicon. 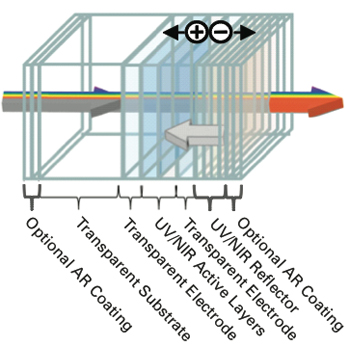 Thin, light, transparent photovoltaic arrays offer great potential. Modern cities are full of buildings with large vertical surface area – and glass wrapped skyscrapers are full of people who need power. Richard believes that the installation of coated windows in a skyscraper could provide more than a quarter of the building’s energy needs without changing its visual appearance – inside or out. Richard said: “It opens a lot of areas to deploy solar energy in a non-intrusive way. It can be used on tall buildings with lots of windows or any kind of mobile device that demands high aesthetic quality like a phone or e-reader. Some people have argued that solar panels are ugly and intrusive. This is a fantastic piece of engineering that looks beyond, or dare I say through, that problem by offering a solution that can harness the sun’s energy on any surface area, without spoiling the view. Solar energy can reduce pollution, contribute to climate change mitigation, enhance sustainability and it is practically inexhaustible. This is an excellent example of chemical engineers forging a path to a more sustainable energy solution and improved quality of life. The future is clear – in this instance, quite literally! Are you working to innovate solar cells, if so, why not get in touch and share your story?